In September 2003 PHASE 4 Learning Center, Inc. opened its first center in Century III Mall (West Mifflin, PA) with one school district and six students. 2004 – Chosen by the Pennsylvania Department of Education as one of ten best model alternative education programs in the Commonwealth. August 2004 – At the request of the Governor’s Action Team, PHASE 4 designed and opened campus model alternative education programs in Monessen and Washington. Additionally, PHASE 4 was commended by First Lady and Judge Marjorie Rendell for our civics/citizenship program. August 2006, With funding from the Heinz Foundation, PHASE 4 opened a center in East Liberty to serve students from the City of Pittsburgh and the eastern suburbs. 2006 – Awarded full Middle States Accreditation (MSA) with Deborah Clawson, Chair of MSA, declaring that “PHASE 4 is changing the regional landscape in education.” PHASE 4 Learning Center, Inc. is the ONLY provider of alternative education programming in the Commonwealth to hold Middle States Accreditation. 2007 – PHASE 4 founder, President & CEO, Terrie Suica-Reed named National Administrator of the Year for Simon Youth Foundation. For the 2007 – 2008 school year, more than 500 students attended one of three PHASE 4 centers from partnering school districts. August 2008, Harrisburg Mall center opens to serve the students of Central Dauphin County. September 2008, PHASE 4 opens a center in Beaver Valley Mall to serve students from Beaver County. This is the first county-wide solution to alternative education in Pennsylvania. In 2009, PHASE 4 was identified as an Exemplary Program by the Hanover Research Council. 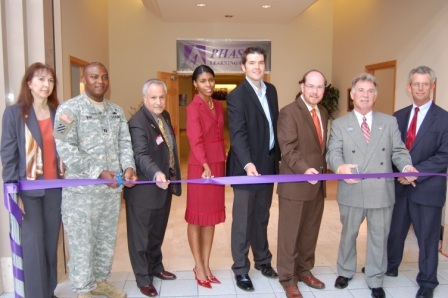 January 2009, the Philadelphia center opens in the Army Experience Center to serve students in The School District of Philadelphia. 2010 – Named a Model Program for the National Dropout Prevention Center/Network. PHASE 4 participated in Pennsylvania First Lady Susan Corbett’s “Opening Doors” initiative that focused on middle school dropout prevention. Governor Tom Corbett recognized PHASE 4 for our success in addressing the state’s dropout rate. Identified by The Pittsburgh Business Times as the largest private school serving Western Pennsylvania for 13 consecutive years. On April 11 – 13, 2016, PHASE 4 Learning Center, Inc. and our 3 Rivers Clubhouse in East Liberty were honored to serve as local hosts for The Clubhouse Network’s 2016 Annual Conference, held at the Renaissance Pittsburgh Hotel. PHASE 4 has maintained a 98% graduation rate since inception, with five percent (5%) of graduates choosing to serve their country in the military, thirty-five percent (35%) have plans to attend college or post-secondary training, and sixty percent (60%) are entering the workforce. Since 2003, PHASE 4 has served over 16,000 at-risk individuals targeted to drop out of high school.